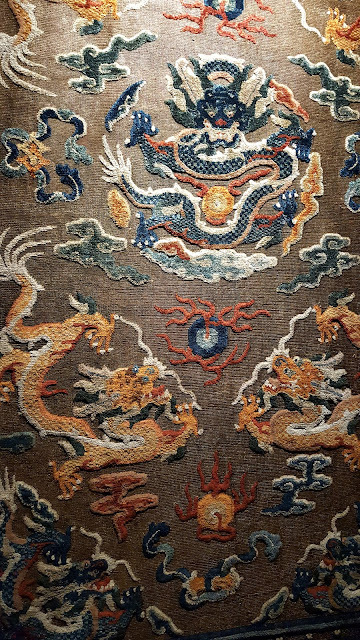 The Asian Art Museum though doesn't only offer a full permanent collection ranging from Persia to Japan, from Indian stone carvings to the Hokusai wave, but it always strives to keep a pulsing connection with the other exhibits in town. This is how a comparative exhibit of Monet's reproductions and original Japanese prints has been magically set up till January 31 2016! 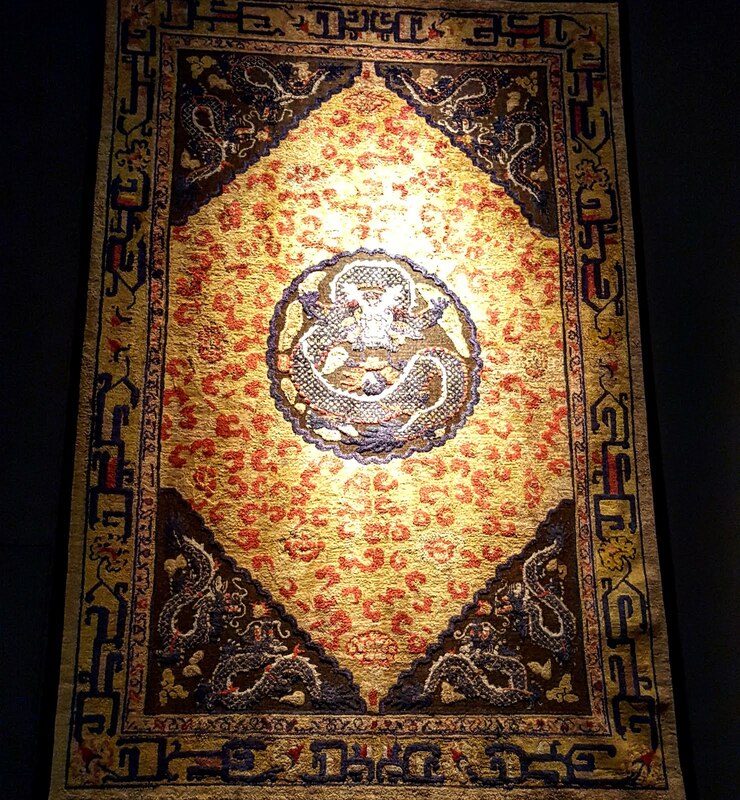 Right now though the spotlight is actually on an impressive temporary exhibit of rare Chinese carpets. When we received the invitation to the inauguration and read the title "The Dragon and the Golden Flower. Power and magic in the imperial China carpets" we knew we just couldn't miss out on it! This special exhibit will be open till March 28 2016 and it displays 36 imperial carpets of the 18th and 19th century. 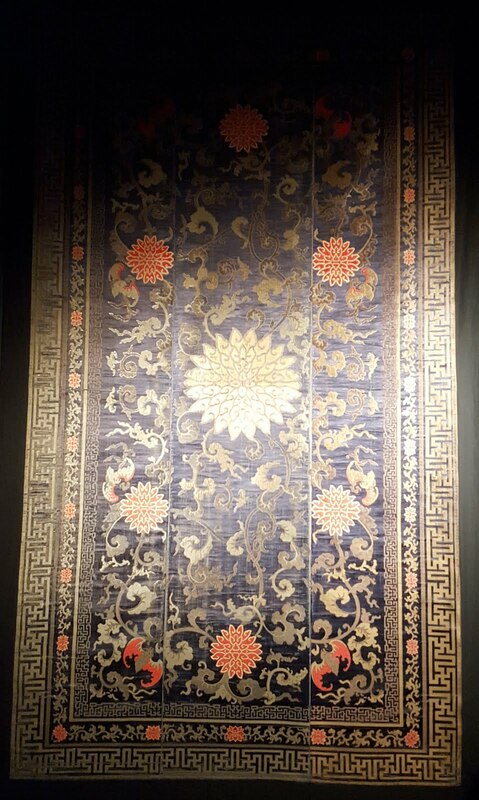 These were the carpets that covered some of the rooms of the Forbidden City in Beijing back during the Qing dynasty (1644-1911), and the richest and more symbolic ones were those the emperor sat on or walked on. Any art lover and Asian culture aficionado deserve to see these masterpieces of art, history, weaving techniques and philosophy: this exhibit concentrates 36 of the most beautiful 300 remaining specimens of the imperial past, when the emperor was believed to be the Son of Heaven and destined to ascend to the Garden of Delights where he would live eternally. Following the Chinese iconography, the Emperor was usually represented as a dragon and in these carpets we can see him beautifully portrayed as the blue dragon, Lord of Earth and Water. 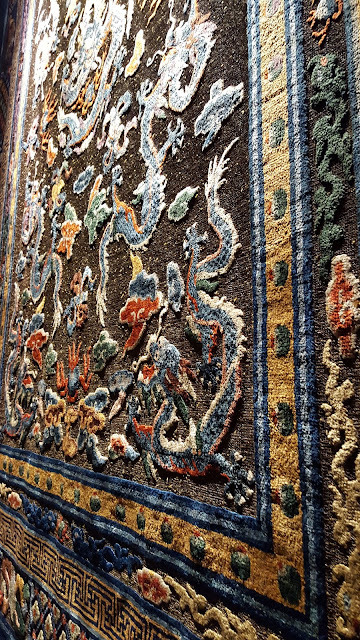 The details of the dragons, the claws, the scales, the teeth, the colors and even the carpet textures leaves the visitors in aw. First of all we notice the bright colors and how it is hard to take good pictures. This is because back then, the master weavers hired by the imperial court were skilled artists who adopted new techniques and materials to convey and reflect the imperial magnitude. For the first time, silk and cotton replaced wool adding extra softness and thickness to the patterns highlighted by special threads plated in gold, silver and copper. 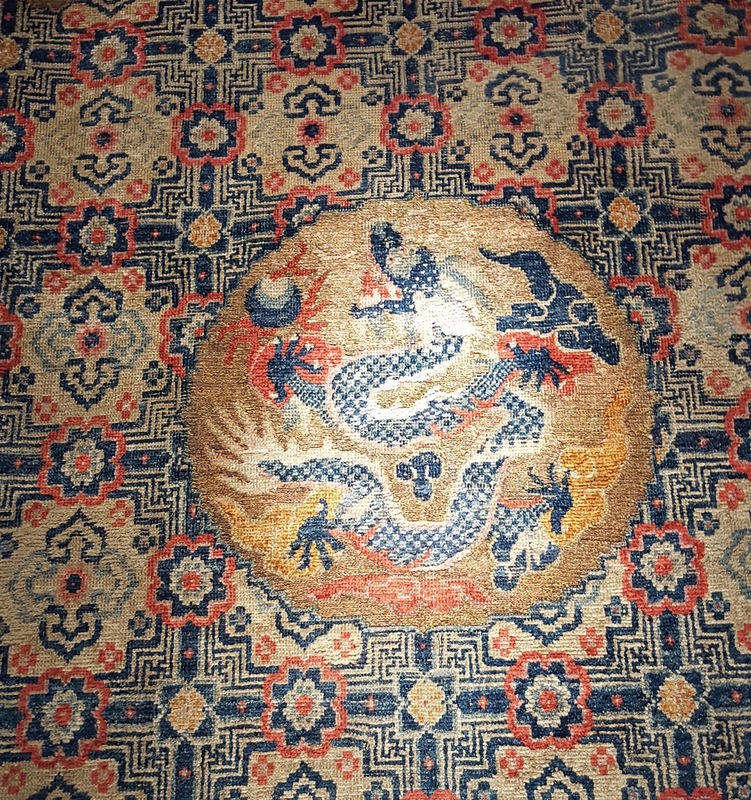 It is easy to imagine the glistening effect of such works and the feeling they provided, in fact, nothing was left to the chance: the mandala compositions, the numbers of the dragons and even the background patterns follow elements of Taoism, Buddhism, Confucianism and Shamanic cosmogony. These same concepts and representations also include the Yin Yang alternation of female and male energy, cold and hot, darkness and light, metallic-cold and soft-warm feelings. 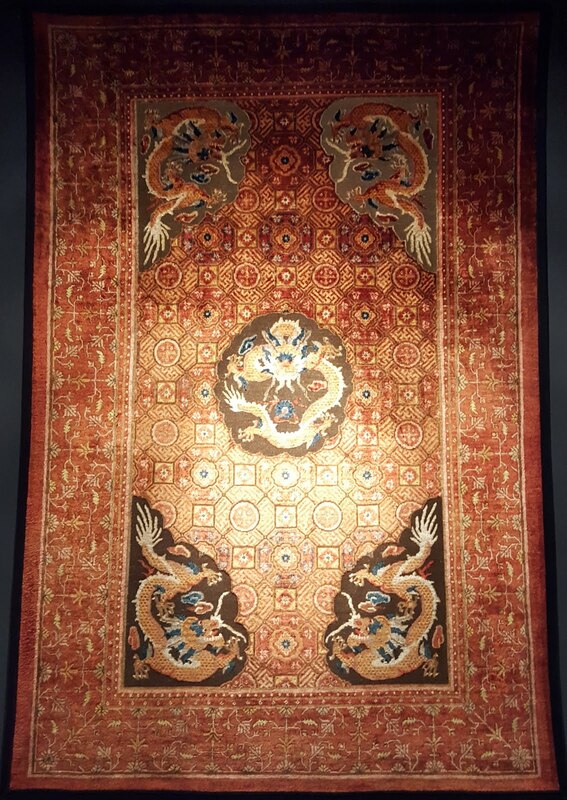 The whole Chinese cosmogony and the way it is depicted in these carpets is simply fascinating and alive; the mere idea of how a simple object like a carpet, could become the cosmos representation of the universe and how it materially achieved this task is just astounding. However, starting from the Forbidden City map and how mandalas represented the universe, it is easy to see how the Son of Heaven was supposed to tread on gold so that his own light could be reflected and enhanced and at the same time, how the carpets that covered his imperial rooms were small pieces of his universe. 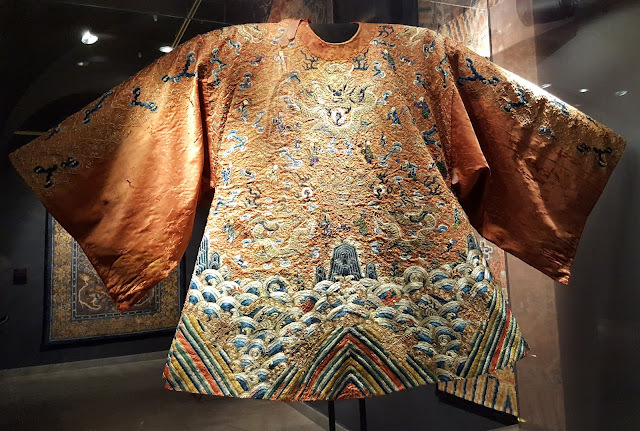 Even his clothes assumed the role of small carpets as they had to herald his authority and thus, were often made of gold - the noblest of all metals, the purest one, the one with the power of providing immortality. According to the alchemical theories of the 1st century, the emperor could chase demons and communicate with the Gods by drinking and eating from dishes and cups made of gold. Probably, with the passing of the time, treading on gold acquired the same value. As for the other protagonist of this exhibit, the Golden Flower, according to the Taoist philosophy, its thousand petals represented the divine energy and the universe. Traditionally, there existed two kinds of alchemy: the outer one made of the herbal remedies that could bring to immortality through the composition of elixirs, and the inner one made of the spiritual practices, like meditation that transformed the practitioner's energy into an elixir whose symbol was the Golden Flower..
By eating the elixir, the practitioner produced a "pearl" that summed up the three treasures or principles sustaining human life: jing - nutritive essence, qi - spirit, shen - supernatural being. These essences are what dragons puff out and are represented as colored clouds sublimating dew. This is how pearls are formed made out of both water and fire. The next passage requires the practitioner to transform with his energy, going from the lungs to his kidneys, this dew pearl into the golden flower. This exhibit has a its own soundtrack, special clips and a pleasant essence to enhance the visitors' experience into the imperial and heavenly atmosphere. 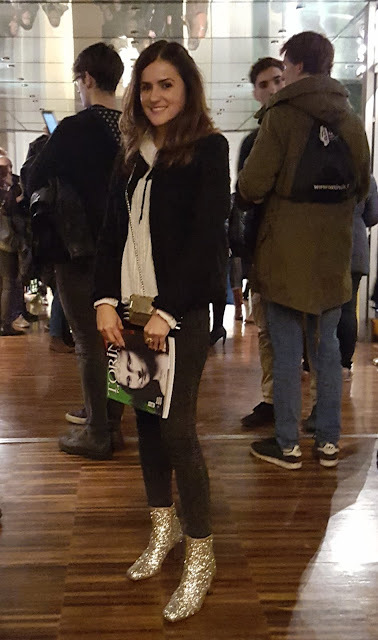 As part of this museum's constant mission to connect with new audiences and to welcome more and more visitors, this past week-end there was also an event about design and fashion. 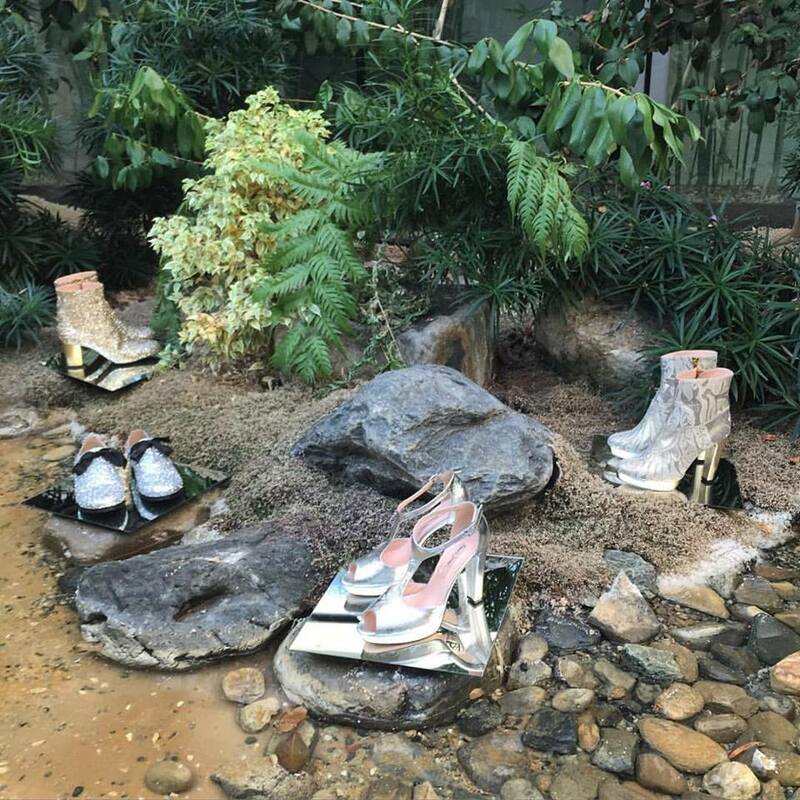 Turin has always been the Italian capital of design, and Italian fashion was born here too, so 8 local designers were invited to present their works and do two performances focused on the concepts of contrast, harmonies and balance. Our friend and shoe designer Manuela Gomez was one of the 8 guests who took part to this engaging event! Now you know it, don't miss out on the MAO - Museo d'Arte Orientale - Asian Art museum of Turin because you'd miss unique art masterpieces and one of a time special events!